September 15 is celebrated as Independence Day in many Latin American countries, but in U.S. political history that day might be remembered as the beginning of the end of John McCain’s presidential ambitions. The collapse of Lehman Brothers, and the federal government bailouts of AIG, Freddie Mac and Fannie Mae completely changed the dynamic and narrative of the campaign. While mock outrage over lipstick on a pig and real issues of national security – McCain’s strong point – had been driving the media cycle and coverage, the biggest financial crisis since 1929 completely changed the playing field. And John McCain blew it. “The fundamentals of our economy are strong,” McCain said at a campaign event the same day that the markets were going haywire. This was manna from heaven for the Democrats, who proceeded to hammer McCain mercilessly over the comment. His subsequent reversal did little to undo the minimal political damage caused by the original comment. His decision to “suspend” his campaign will probably leave voters at large with a very unfavorable impression of him. David Letterman did him no favors either, brutally eviscerating him after finding out that McCain canceled an appearance on the Late Show – not to go back to Washington and work on the legislative bailout package as he originally claimed – but to do an interview with CBS Evening News anchor Katie Couric. “Hey Senator, can I give you a ride home?” Letterman facetiously asked as the show took the live in-house CBS feed of McCain getting ready for the interview with Couric. This may well go down in history as a late night campaign moment, potentially up with Bill Clinton playing saxophone on the Arsenio Hall show back in 1992. Given the influence of late night comics at reaching the electorate who may not get their dose of politics from hard news programs like the NBC Nightly News or 60 Minutes, having someone with Letterman’s influence and reach taking him out to the woodshed on a semi-regular basis won’t do McCain any favors. Letterman continued his comedic assault on McCain a day later. “Here’s how it works: you don’t come to see me? You don’t come to see me? Well, we might not see you on Inauguration Day,” he said. Sarah Palin’s disastrous interview with Katie Couric only served to reaffirm doubts among her critics, raise them among her supporters and the punditocracy about her qualifications to be vice president, or step in and take over for McCain in case of an emergency. Her responses to legitimate questions from Couric were a series of talking points incoherently sequenced together to make something she hoped resembled a sentence. The McCain campaign will keep her as far away from the press as possible after the vice presidential debate. The only upside from that interview is that it has effectively set the bar so low for the vice presidential debate that it will probably be considered a success for her just for showing up and taking questions. Joe Biden doesn’t even have to attack her – all he needs to do is look and act like the elder statesman he is in answering questions, not make any gaffes, and let her dig herself into a hole before a nationally televised audience of millions. But perhaps the biggest jumping the shark moment in this two week self-implosion was McCain boldly proposing to postpone the first presidential debate and reschedule the vice presidential debate – having been agreed to by both campaigns and the debate commission long before – unless Congress passed a bailout package. McCain effectively boxed himself into a corner that left him with no good options. If he didn’t show up, he would effectively give Barack Obama 90 minutes of free uncontested airtime to millions of voters and anger potential voters in Mississippi, where Ole Miss had already spent more than $5 million in setting up for the debate. If he reversed himself and did show up – with or without a package ready to go – he would look like he backed down from a threat he couldn’t carry out. 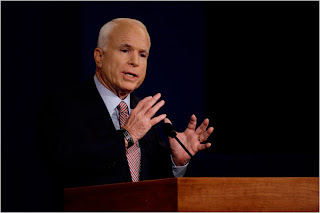 During the debate, McCain said “If you’re going to aim a gun at somebody, George Shultz, our great secretary of state, told me once, you’d better be prepared to pull the trigger.” To phrase it using those terms: McCain aimed a gun at these debates, threatened to pull the trigger if Congress didn’t pass a bill, and backed down. The fact that his campaign had produced web ads proclaiming McCain won the debate, which were released before it even took place, shows McCain took the pulling the trigger option about as seriously as most political observers take Ralph Nader now. There are five more weeks and three more debates to go between now and Election Day, and we’ve already seen how much the dynamic can change in the course of one day or one event. McCain and his surrogates (Rick Davis, Steve Schmidt, Carly Fiorina, Douglas Holtz-Eakin) have been misfiring on nearly all cylinders during the last two weeks. Unless McCain is able to fundamentally shift the dynamics of the race in his favor, or some outside event does it for him, he will spend the rest of the campaign watching his presidential ambitions slipping away.